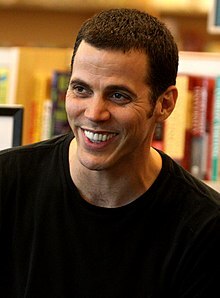 Stephen Gilchrist Glover (born June 13, 1974), better known by his stage name Steve-O, is an English actor, stunt performer, comedian, and musician. His entertainment career is mostly centered on his performance stunts on the American TV series Jackass, its related movies, and its spin-off series Wildboyz. As far as a compassionate lifestyle and [it being] healthy for me, for the planet and all the life on it, vegan is really the best way to go. It helps me a lot. I really believe that I'm doing something good for me and for everyone else every time I eat, you know. "Johnny Knoxville and Steve-O: Jackass 3D", interview with SuicideGirls (October 14, 2010). Being a vegan, caring about animals … all this compassion in my lifestyle is the reward in and of itself. "Steve-O Snags Top PETA Honor", PETA (July 18, 2011).